The inner bracelet circumference measures approximately 5-1/2", plus a 1-3/8" opening, and 1-3/4" at widest point. What a lovely bracelet! 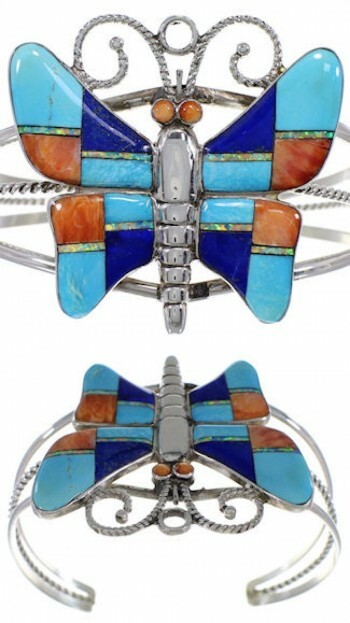 The bracelet is hand made out of genuine sterling silver and multicolor inlay. The inlay consists of: real Turquoise, Lapis, Oyster Shell, and man made Opal. The inlay is delicately set, while forming a stunning butterfly design for a marvelous look Twisted silver and stamped patterns accent and add style to the bracelet. Two silver bars and a band of twisted silver create the cuff and complete the bracelet beautifully. The bracelet is hallmarked.